I want to make you all aware of a situation that has occurred at In the Pink, resulting in a direct loss of $13,416.96. This of course, is alarming and has left In the Pink with a debt to someone that appears to be unrecoverable through insurance, the bank, etc. 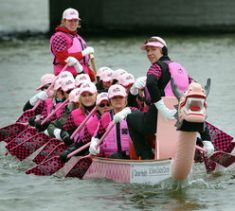 Many of you know that In the Pink hosts the Jacksonville Dragon Boat Festival each year as its primary fundraising event. Leading up to our event in September, I was emailing back and forth with Great White North, a dragon boat production company that provides the boats and timing for our races each year. During a constant string of emails, I asked what my balance due was so I could mail them payment for the balance due. The balance was $13,416.96, as indicated in their email. At that point, someone captured our email interactions and asked that I directly deposit the amount owed to their bank in New York. The routing number and bank account number was provided. I immediately transferred the money through an ACH deposit to them. Little did I know that the account provided was not a Great White North account! Within a week or so, GWN began asking me when I would be sending the money. Of course, that is when we discovered that the money had been issued to an unknown person. I reported this fraudulent activity to the local police, the FBI, my bank, my insurance company, and the receiving bank. After many months of waiting for decisions, I am told that no one is “responsible” but me since I directly initiated the fraudulent payment. Needless to say, this is pretty alarming! I am shocked to find out that such activity is not covered through the bank or my insurance policy. This has been a huge, ongoing process. It is frightening to me that there are no safeguards for us as consumers that cover this type of activity. It is truly sad. Needless to say, I have changed my policies and procedures to require only direct phone conversations with the contact as confirmation when large sums of money are in play. GWN has been very patient about waiting for the process to be completed, knowing that I was a victim of fraud. However, I cannot expect them to wait much longer, given the large sum of money owed to them. In the Pink does not have that amount of money in our bank account. As the Founder & CEO, I have always tried to be a good steward of the money donated to In the Pink. We have been able to care for thousands of cancer patients since 2009 and have always run on a very tight budget. This is why I am turning to you, as a friend of In the Pink. If you can make ANY monetary donation to In the Pink at this time, it would be greatly appreciated. This is truly the only way we can possibly pay the debt owed. This is not a letter I ever expected to send to all of you. I know that this plea comes at a difficult time of year, with the holidays upon us. I really appreciate your help. Please feel free to forward this letter to your friends, family, co-workers and companies. As a 501c3, all amounts donated are 100% tax-deductible and each person will receive a tax letter. All the best to each of you for a wonderful holiday with family and friends!